Maggie is stunned to find that Angelique’s twin sister, Alexis, has arrived from Italy. As the house falls under her spell, few believe she’s not Angelique returned. Meanwhile, Cyrus Longworth tells Chris Collins about man’s duality. At Collinwood, Quentin is entranced by Alexis’ rendition of “Ode to Angelique,” and as they are about to kiss, Maggie stumbles in and storms out. Riddle me this: when is a twin not a twin? But it’s not Mirror Time. It’s Parallel Time. Perhaps the differences should be slight. Protecting the brand is important, and they make hay with characters who largely won’t be in HOUSE OF DARK SHADOWS. If they had made this a universe where vampires were the norm and Barnabas joined a human resistance or something, it would have set insane expectations for the movie. It is a twin of DARK SHADOWS. Not identical. Not too deviant. And like any fictional twin, it gives us a chance to appreciate the counterpart. Most of them are simply more extreme versions of their Main Time equivalents. This episode drives home the importance of twins because it illuminates the fact that this story will focus on the impact of specific twins in a sea of them. With the arrival of Alexis, we have the establishment of one set. With Cyrus Longworth, we have the next, as he strives to give figurative birth to his own twin, John Yaeger -- his other side. It seems confusing, these twins upon twins. But none of them really are. Alexis is Angelique. Longworth is Yaeger. Smoky is the Bandit. Following that, the larger question is whether or not this parallel universe is a twin or is it simply our own universe with the implications of more extremity (Longworth) or more deception (Alexis)? It’s up to Barnabas to navigate Parallel Time’s maze, and as a man given to outbursts of extremity and a life of deception, this universe may ultimately serve as a very personal mirror. Today features the last SHADOWS script written by Violet Welles. A press agent for Broadway productions, she was also a ghost writer for Gordon Russell, specializing in characters and the emotional subtext of scripts when assisting him. 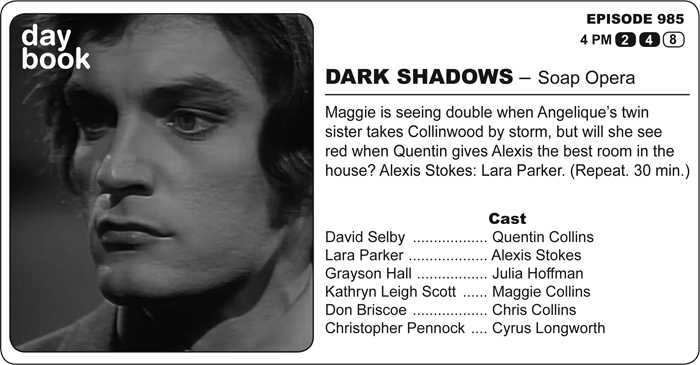 Vaguely the DC Fontana of DARK SHADOWS, Dan Curtis insisted on hiring her, and she made solid contributions to the show, especially in the 1897 storyline, where she began by helping Evan Hanley and Quentin summon Angelique from Hell. This episode hit the airwaves April 3, 1970.